I think there’s a moment when you truly know that a non-Celiac, or non-diabetic, just *gets it*. Maybe it’s when he/she decides to order gluten free at a restaurant because you are, but that already happened with this person, and for some reason, it didn’t have that *gets it* moment. Maybe it’s when he/she spots gluten free menus at restaurants even when you’re not around, but again, didn’t have that *gets it* moment with this one either. Maybe it’s when he/she recognizes three buzzes as dropping and two buzzes as rising when your Dex is sitting in the other room and heads for the juice or reaches for your pouch with syringes and insulin–well, that was the non-diabetic *got it* moment. Today, was the non-celiac *gets it* moment. Now, when I told him this happened, I just complained about the drunken idiot who managed to spill two full beers all over my legs and feet [luckily not my head], but never gave a gluten-anger anecdote. He not only picked up on it, but provided me with a fantastic blog topic, and also a way to sneak in a bit of thought on another topic. For all of the ignorant people you may meet in your life, and I guarantee many will be in your college existence as I am finding out, there will be at least one out there who *gets it*. I’m fortunate to have found a few of these, most of whom make it into my blog in some way or another, but my point is not to abandon ship on finding friends, and important people, in your lives that *get it* despite being totally unaffected by whatever your *it* or *them* may be. I realize my writing has left this ominous presence of some male in my life who is finding his way to *getting it* [and not in that way!] and that you don’t know much else about this person. But on a diabetic-celiac blog about my college life, I think that’s all you really need. The non-diabetic highs of life. 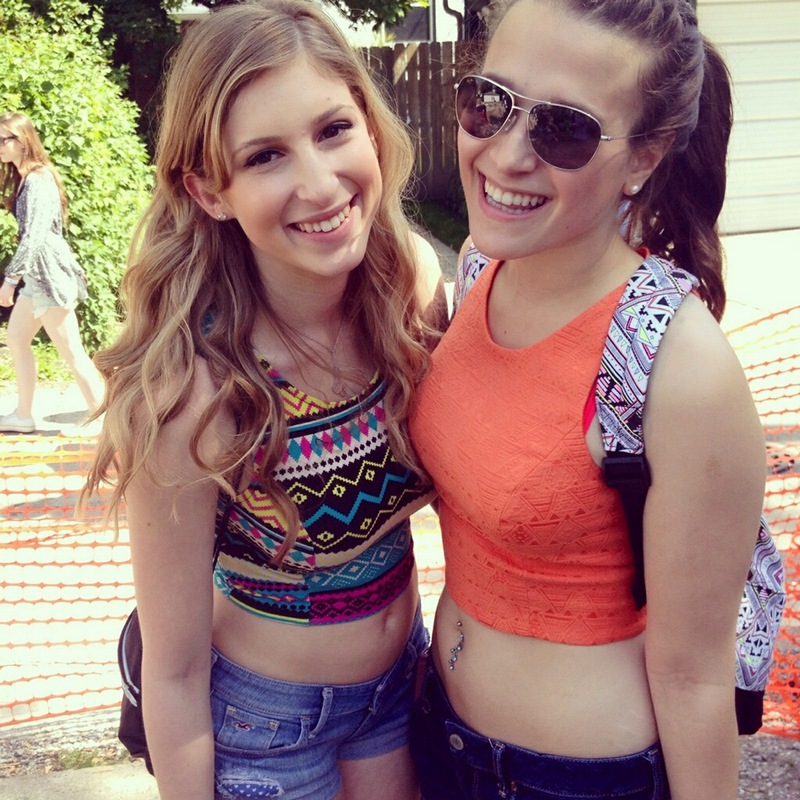 -finish sophomore year at UM: check. -have a decent GPA: check. -be able to run a 5k by the end of July for the Big 10 5K in Chicago: currently at 2.5 miles. getting closer. 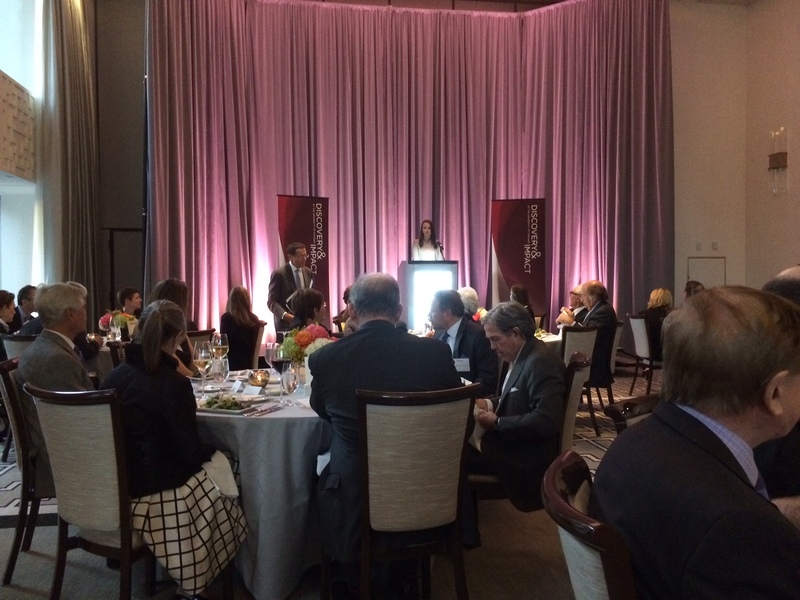 -give a speech at the University of Chicago Celiac Disease Center benefit: check. -get asked to speak again at the University of Chicago Discovery and Outreach event for donors: check. -trudge through the first of two six week sessions of organic chemistry: unfortunately, check-in-progress. bleh. -turn all patient experiences into becoming the optimal patient care intern at the Rehabilitation Institute of Chicago: check. Speaking at the UChicago Discovery and Outreach Event! Life has become yet another whirlwind of driving up and down Lakeshore Drive, absorbing insane organic molecule structures which at some point, definitely give off an aura of make-believe, and beginning my summer internship at the RIC. There’s a certain type for elation that only a chronic patient can have when working with other patients–a main reason I want to go into medicine down the line. Though I cannot disclose the particulars of my internship and work at RIC, working on the spinal cord injury floor has given me a new appreciation for life and all that I do have going for me. It’s important that, though as chronic illness patients we do definitely struggle, we recognize that we are, in the grand scheme of things, extraordinarily lucky and that life can change in an instant–as it has for many of the patients who I work with, many of whom I now can call friends of my own. In the diabetic-celiac world, quick finger pricks between patient rooms, in the parking garage before a gluten free packed lunch on the road to class, in the middle of class before my little bag of pistachios as a snack, on the side of the workout room before my bootcamp workout class starts after organic chemistry ends and I battle traffic home, with all the injections in between are the norm right now. Though admittedly the Dexcom could alleviate some of the hassle, because my stress is much lower in the summer, I have decided to give my arms a much needed break–and an added bonus of losing awkward tan lines! Have supplies, will travel! Enjoying “Dillo Day” at Northwestern with an old friend who specifically cleaned her fridge for me! Take it easy, but take it. I’d love to hear from you guys about things you want to read about, questions, your lives–anything. PS- My mom is famous for her cheesecake, for decades. I’ve taken it upon myself to work on perfecting the art of a cheesecake and made one recently for her birthday; it was absolutely delicious! 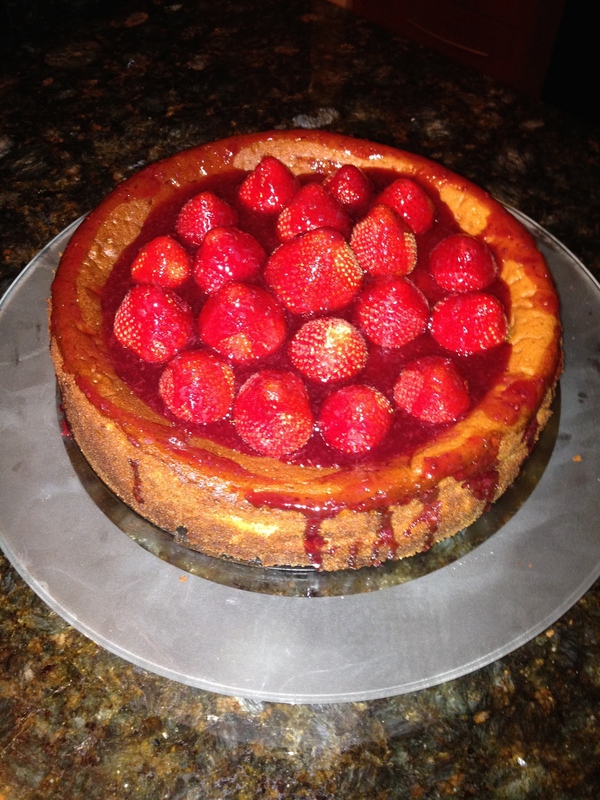 Yum, cheesecake with strawberries and a raspberry glaze. that awkward moment when you meet someone, busy munching a bagel, who reaches toward me for a handshake. uh…yeah, no thanks. take it easy, but take it–sans gluties. I hate that I haven’t written in over a week. My CGM has officially taken on a new role, a CSM. With a frenzied day-to-day existence right now, comprised of 12+ hour days, ever-changing Levemir doses, quick meals on the fly before exams, endless hours trying to navigate Adobe Illustrator to create a research poster in time for the conference in T-minus 12 days…well. That’s why I haven’t written. 1. Yes, I know that stressing about the stress of high blood sugars is obviously not helping. 3. But, sometimes that’s just a day in the life. These few weeks have been very trying of my mental strength, and my physical not-so-strength. With two conferences, 4 exams, and 21 days of classes left–I’ve got to pull through. 4. PS- though this is NOT MEDICAL ADVICE, the extra days past 1 week on the CGM are allowing for some crazy accurate days, which is one less thing to think about. Except…that peeling tape is definitely not my most attractive look. Maybe I’m grateful for the 19 degree, end of March day we’re having in AA today? Just kidding. Get me out of this season. 5. PPS- Definitely turned off the high alert on the CGM this week after nearly chucking it against the wall after the 4th alarm overnight from the tiny fluctuations above and below the threshold. I ONLY GET FIVE HOURS OF SLEEP AS IS, SO PLEASE CGM, SHUT UP. -Lettuce+Tyson Grilled and Ready Chicken Strips+ Annie’s Roasted Red Pepper Dressing+ SteamFresh Green Beans+Sargento Mozzarella Shredded Cheese+sliced cucumber= a salad-in-disguise for a non-salad eater. -Turkey-Cheese Wraps [don’t be stingy on the turkey! ]+3 pickles+Diet Snapple= perfect quick lunch before more Calculus 4 cramming. Again, I ‘m sorry it’s been ages. I’m always available for a quick email [or Tweet @briwolin], just not entirely on top of cohesive posts these couple weeks. Take it easy, but [find some crazy way to] take it.